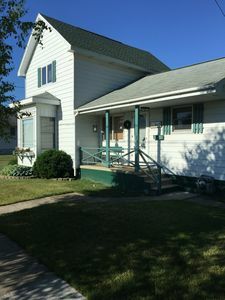 Woodsy, private and pet-friendly spacious modern home in a great location across a quiet neighborhood street from Tawas Lake. 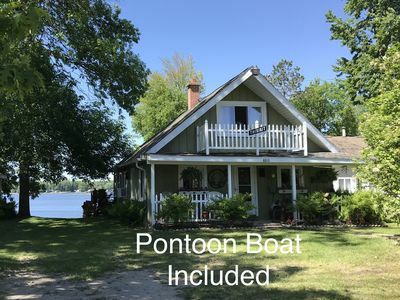 Easy lake access with rowboat provided. 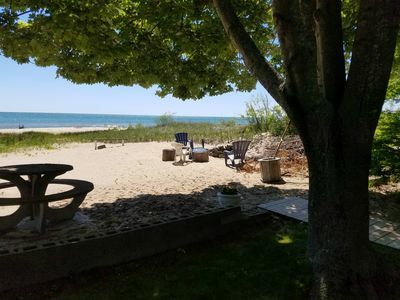 Only one mile from the Lake Huron beachfront park and quaint shops of East Tawas, the nicest tourist destination on the Sunrise Coast. WWII, hunting, and fishing antiques are displayed in the house to celebrate Glen's life and times. I released a book and DVD (Echoes Through Time: WWII and the Northwoods) based on the 270 letters he sent home to Ma during WWII. I inherited the house and the letters from Glen. He was my best friend and outdoors mentor. Display copies are available for reading or viewing at the house. Fully updated with all new appliances in 2006, all new furniture in 2013. New gel queen bed in 2018. 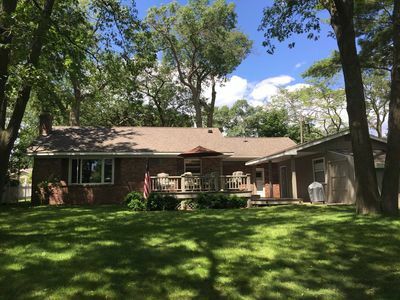 House is on three lots with huge oak trees and nice views of Tawas Lake and the surrounding woods (look for the deer!). The main street of East Tawas ends at the waterfront park and is lined with antique stores, casual or fine dining establishments, a classic movie theater, and a variety of other shops. 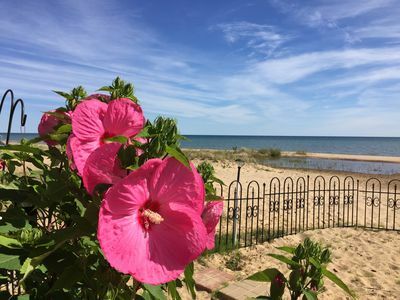 The East Tawas/Tawas City area spanning Tawas Bay is the perfect size - small enough to be uncrowded and quaint but large enough to have lots of activities, large grocery stores, and a variety of shops and dining. 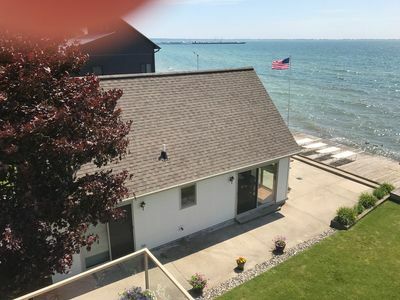 Nearby Tawas Point State Park juts into Lake Huron with another super beach, historic lighthouse, and an extensive hiking area at the end of the point. 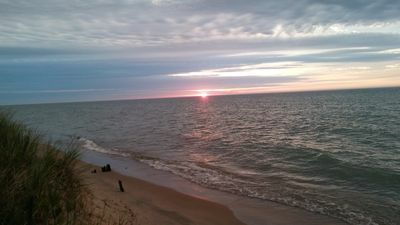 Tawas Point is a nationally known bird watching area year-round, with even more to see during spring and fall migrations. 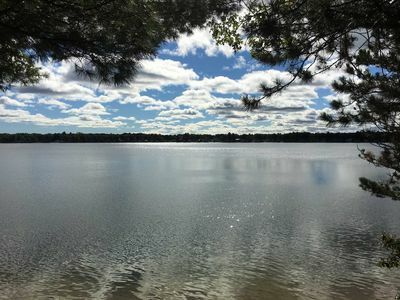 The Huron National Forest, the famous Ausable River, Tuttle wildlife refuge, Lumberman’s Monument, and many lakes are all within a short drive from the house. 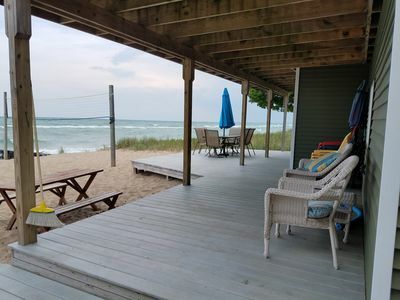 Take a scenic 12 mile drive along Lake Huron to the small tourist town of Oscoda at the mouth of the Ausable River but stay in East Tawas where there’s a lot more to do. Every season offers new activities. Spring has a burst of wildflowers and waterfowl (and low rates). A northwoods summer is usually warm without being too hot, I only rent weekly during the peak summer season (unless I’m open at the last minute). Fall colors are outstanding throughout the area. Fall also brings hunting season. There is ample public land for deer hunting nearby and Tawas Lake hosts incredible waterfowl flights. Spend a great Christmas - New Years holiday week in the North. Closed after the Holidays, open in March. We had a wonderful weekend at your cottage. Everything was very clean and roomy. In fact, we spent most of our time in the room at the back just relaxing and talking. C.G. 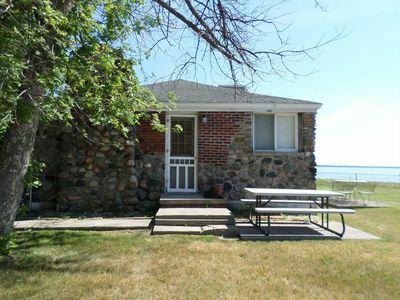 Thank you for the opportunity to rent your place in East Tawas. 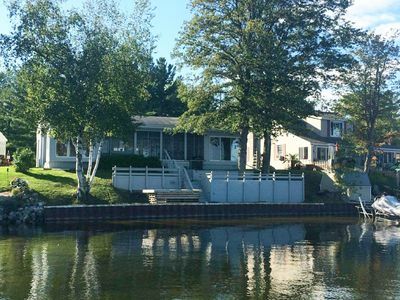 My son became an avid fisherman, with your home conveniently located, he went fishing daily on Tawas Lake, off the pier in town and on the AuSable River. We saw our first Bald Eagle with my husband's telescope across Tawas Lake, along with many Sandhill Cranes flying in every evening, very exciting! The sunsets where beautiful on Tawas Lake. There were Osprey nesting at Tuttle Marsh, not to mention all the birds at Tawas State Park. Thank you also for allowing us to spend an extra day. 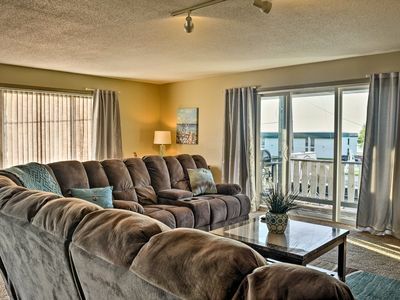 We may be repeat customers as we love the location and the amenities in your home. M.D. Hi, we just got back and wanted to let you know that we really liked it and will take it again next year, same weekend. L.F. 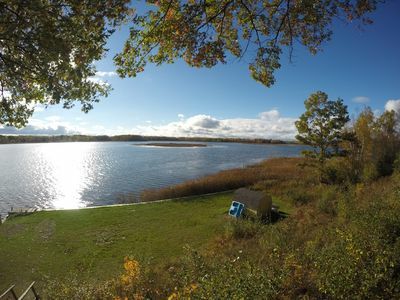 I have discussed 're-kindling' our old tradition of the family going to Tawas Lake in the spring to catch bluegills. The boys and I did well, about 400 or so in the week we were there. They had an awesome time. 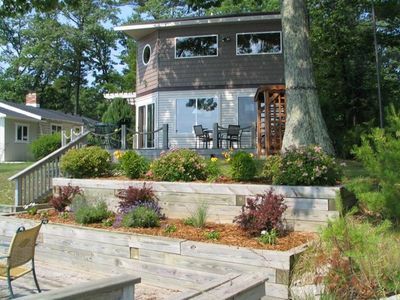 I would like to, if possible, reserve the cottage for next spring. J.R. I look forward to renting again. We have so enjoyed it there the last two years. S.R. The house was great, we enjoyed our stay. I'll keep your place in mind for another trip. S.L. Thanks again for the cabin. It was perfect for what we needed. J.G. 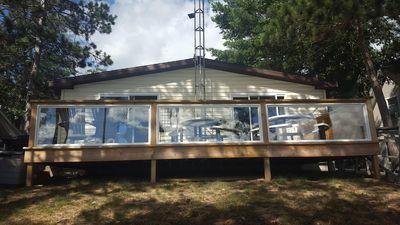 Thank you so much for sharing your cottage in East Tawas with us. We enjoyed a truly restful few days; something we needed badly! Everything was wonderful! S.Z. We had a great time. Not knowing exactly what to expect we were very pleased to find a spacious, clean, comfortable and well-stocked home. The proximity of your place is so convenient yet off the beaten path. I'm hoping to come again and next time will try to rustle up a kayak to borrow for exploring some more around Tawas Lake. C.W. The cabin was superb...clean and homey feeling. C.F. We had a great time. It was quite relaxing and accommodating with all the creature comforts. East Tawas is a nice little town and we loved the state park and beach. T.E. 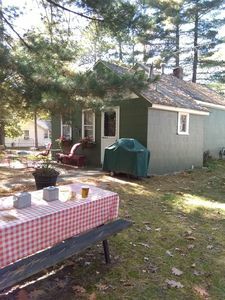 Thank you so much for sharing your cottage in East Tawas with us. We enjoyed a truly restful few days; something we needed badly! Everything was wonderful! S. V.
Well, we are home from a wonderful week at your cottage/cabin. I expected good, we got FABULOUS - and I want to thank you! The house is adorable - not so important to a man, most likely, but to a woman who must avoid daylight and so spends her days inside, it was very important. It is surprising how a small cottage can feel so big also!! 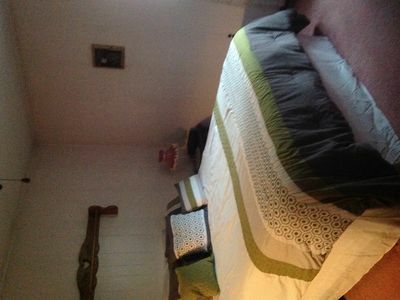 But even better than cute and spacious, the house was spotless!! 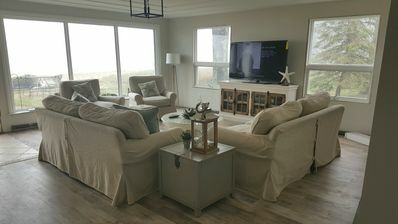 I used to own a cleaning service and I was totally impressed with how clean Mrs. Kirby keeps the house! It was such a joy! E.T. 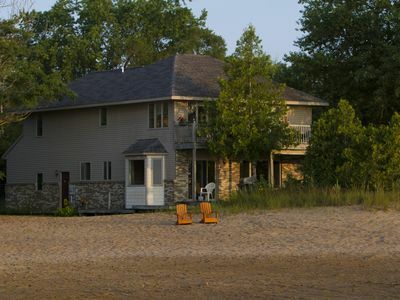 Thisisit Lakefront Cottage Includes 24' Pontoon Boat and Sandy Swimming! 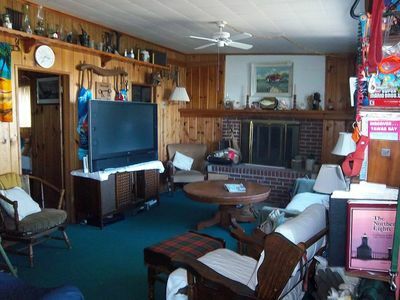 Lovely Five-bedroom , Two Full Bath, Two Story Home On Lake Huron. 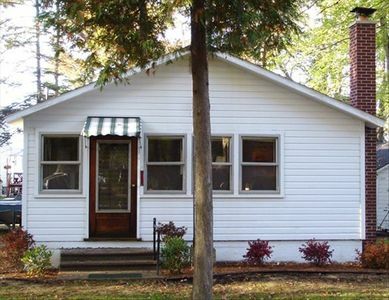 Cute 800 sq ft. cabin across the street from Long Lake.